The conservation project was commissioned by the Vatican State Office PCAS “Pontifical Commission for Sacred Archaeology” in Rome. Alma Ortolan worked as Chief Conservator and was in charge of the project. 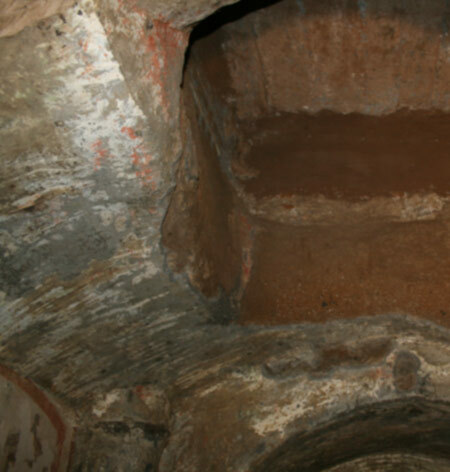 A team of experts carried out a long-term research project on tuff consolidation, the aim of which was to investigate the state of deterioration of the material and evaluate the chemical procedures to stabilize the hypogenous tuff in the catacomb. The project involved a formal research partnership with the ICVBC CNR Institutions in Florence (Italian National Research Council) and the company “Arcadia Ricerche” in Venice. Ortolan, Alma and Barbara Mazzei. Il restauro di un cubicolo storico, come restituire aspetti diversi del passato, in Lo stato dell’arte 7: VII congresso nazionale IGIIC, Napoli, Castel dell’Ovo, 8-10 Ottobre 2008 in conference proceedings IGIIC – Italian Group International Institute for Conservation, Napoli, 2009.